The Passionate Foodie: The machine that will put me out if a job!!!!! The machine that will put me out if a job!!!!! Being a chef is one of those careers that you could almost always gaurentee you a job because well everyone has to eat right?? We'll I have recently become fascinated with a kitchen appliance that will soon put me out of a job and let everyone have restaurant meals right at home. It is a little pricey, costing just under the 2,000 dollar mark but once you see what this German engineered robot it is capable of, the cost will be the last thing on your mind. It chops,beats, mixes, whips, grinds, kneads, minces, grates, juices, heats, stirs, steams ,mills and weighs your foods all in 1 machine. Seriously do yourself a favour and check out the link www.thermomix.com.au and watch the videos of what it can do! It allows you to know what goes into your food without the preservatives and hidden ingredients. Great for dietary needs as well, it produces top quality restaurant food in minutes and you don't even have to watch it just set the timer and walk away, Done! 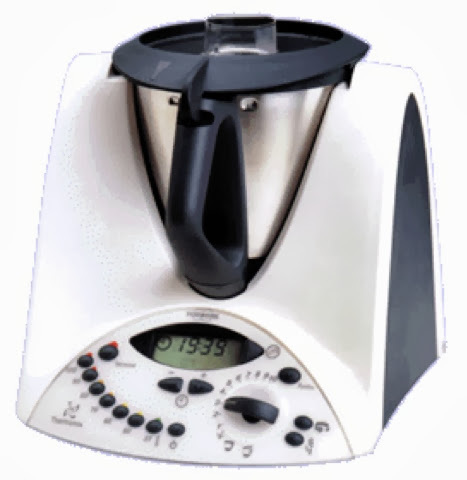 I am now completely in love and with one on order am sure many more of my posts will be thermomix inspired. However if that doesn't inspire you George Columbaris has one too, and if it's good enough for George I'm sold! !